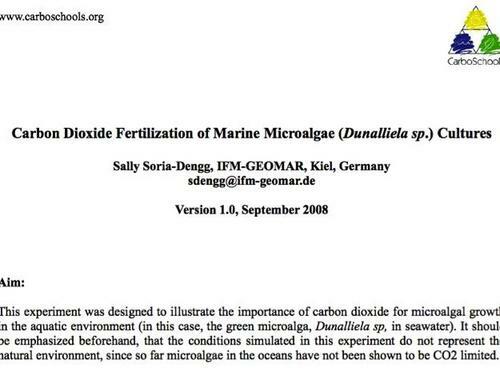 Educators might want to emphasize to their students that the conditions simulated in this experiment do not represent the natural environment, since, so far, microalgae in the oceans have not been shown to be CO2 limited. The resource includes some suggestions on how to improvise seawater, nutrients and algal culture. Since this experiment takes several days to perform, it may be helpful to have students take photographs (as in the activity description) to illustrate the changes. Take pictures or drawings of culture flasks every two days. Students should do this experiment within the context of the ocean biological pump and its relationship to the global carbon cycle. Students may be led to think that phytoplankton will solve the problem of too much CO2 going into the water. Thus, it is very important that teachers talk about limiting factors (nutrients, iron etc) that are critical to phytoplankton population growth. Teachers should strongly consider including a nutrient-deficient experimental bottle with enhanced CO2. Dunalliela is not a toxic algae but if teachers feel uncomfortable with blowing CO2 into flask with a straw, they can produce extra CO2 simply using alka selzer and water in a flask with a simple tubing delivery system. This experiment illustrates the importance of carbon dioxide for microalgal growth in the aquatic environment (in this case, the green microalga, Dunalliela sp, in seawater). Algae are grown in CO2 limited, CO2 enriched and control groups. It should be emphasized that the conditions simulated in this experiment do not represent the natural environment since, so far, microalgae in the oceans have not been shown to be CO2 limited. This activity offers a lot of flexibility to educators. It can be done qualitatively for younger students or quantitatively with instrumentation for older students. Variants of this set up can also be used to test the effects of light, temperature, nutrients, etc. on algal growth. The activity lacks an assessment strategy. It should be viewed as a class demonstration, unless the educator restructures it as a lab activity with a focus on good experimental design. Educators will need to create their own student protocol and data sheet if desired. There are experimental options for both qualitative and quantitative analyses. Teachers will need to pull together the equipment and materials needed for this experiment. The easier one is qualitative whereas the one for more advanced students is quantitative and thus involves more equipment. For quantitative analysis, consider the Vernier colorimeter that uses light absorption to quantify the amount of algal growth if a spectrophotometer is unavailable.